Alvaro Naddeo is a Brazilian artist known for combining universal with local elements in his watercolor artworks. The artist’s nomadic lifestyle served as an inspiration for his work as every place the artist lived in left its mark to his autobiographical artworks. In his pieces, you can notice a pharmacy bag from New York, a “proibido estacionar” sign from São Paulo and the outlines of a Los Angeles highway. With his simple yet effective visual language, Alvaro Naddeo conveys true cosmopolitan spirit and social concern. Alvaro Naddeo was born in Brazil as a descendant of the Uruguayan parents. His father was an artist and Alvaro Naddeo spent his childhood drawing on the floor of his parent’s studio. But his artistic career was suddenly interrupted in the artists teenage years. Thinking that he’ll never possess his father skills, the artist decided to give up art and turn to advertising. After 20 years of working in advertising and design, and as an art director in Leo Burnett Sao Paulo and several American advertising agencies, the artist finally decided to go back to art. Living in New York a city of great dynamic and contrast caused the artist to rethink his choices in life and go back to his first love – painting. Apart from his father who had an outstanding influence on the artist’s work Alvaro Naddeo is also influenced by artists like Edward Hoppe and Norma Rockwell but also by the works of those who use elements of advertising in their work like Andy Warhol, Claes Oldenburg, and Ed Ruscha. The artist is fascinated with color combinations of Robert Indiana and Stuart Davis but also by the works of Charles Sheeler, Paul Cadmus and Lee Bontecou. The artist starts his artistic process by loosely sketching the outlines of his future work. He then takes a break and lets his ideas mature before he goes back to finish the piece several days or weeks later. Then he starts to experiment with different possibilities and compositions. 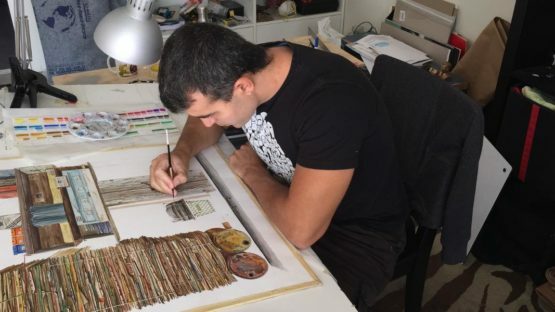 The artist uses Adobe Photoshop and Illustrator to correct proportions and scale among object and get a more accurate perspective after which he transfers the base of the image to his watercolor paper where his pieces get their final shape. Alvaro Naddeo is inspired by marginalized urban objects and the process of their decay. The natural process of deterioration that decomposes the objects, color texture and shape inspires the artist to continuously search and find a new sense of beauty in old discarded objects. 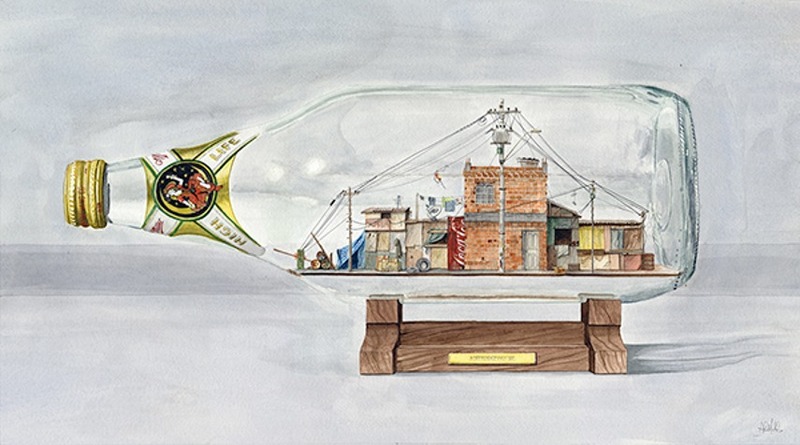 On a political level, Alvaro Naddeo uses art as a tool for criticizing social inequality, over-consumption and the consequences of over-exploitation caused by human greed. The artist uses his work to open a dialogue about these uncomfortable issues that others often try to avoid. The artist is represented by Thinkspace gallery. Alvaro Naddeo lives and works in Torrance, CA.